A new genetics study estimates that approximately one-third of British ancestors were Anglo-Saxon immigrants. Appearing in the journal Nature Communications, the article made use of burial sites near Cambridge to examine the whole-genome sequences of ancient and medieval British DNA. Historians have long debated how extensive was the Anglo-Saxon settlement of Britain, which took place between the mid-fifth and early-seventh centuries. It was during this period that several Germanic peoples arrived and colonized parts of the England, but it was unknown how large this migration was and whether or not they mixed with the native population. An opportunity to resolve these issues emerged with the discovery and excavation of three sites near Cambridge – five samples from Hinxton, four from Oakington and one from Linton. The Linton sample and two Hinxton samples are from the late Iron Age (~100 BCE), the four samples from Oakington from the early Anglo-Saxon period (fifth to sixth century), and three Hinxton samples from the middle Anglo-Saxon period (seventh to ninth century). The two Iron Age samples from Hinxton were male, while all other samples were female. Previous DNA studies have relied entirely on modern DNA and suggested anything between 10% and 95% contribution to the population. One such study suggested that Anglo Saxons didn’t mix with the native population, staying segregated. However, this newly published study uses ancient genetic information and disproves the earlier idea, showing just how integrated the people of Britain were. “Combining archaeological findings with DNA data gives us much more information about the early Anglo-Saxon lives. Genome sequences from four individuals from a cemetery in Oakington indicated that, genetically, two were migrant Anglo-Saxons, one was a native, and one was a mixture of both. The archaeological evidence shows that these individuals were treated the same way in death, and proves they were all well integrated into the Oakington Anglo-Saxon Community despite their different biological heritage.” added Dr Duncan Sayer of the University of Central Lancashire. The genomes of two sequenced individuals (O1 and O2) are consistent with them being of recent immigrant origin, from a source population close to modern Dutch, one was genetically similar to native Iron Age samples (O4), and the fourth was consistent with being an admixed individual (O3), indicating interbreeding. Despite this, their graves were conspicuously similar, with all four individuals buried in flexed position, and with similar grave furnishing. Interestingly the wealthiest grave, with a large cruciform brooch, belonged to the individual of native British ancestry (O4), and the individual without grave goods was one of the two genetically ‘foreign’ ones (O2), an observation consistent with isotope analysis at West Heslerton which suggests that new immigrants were frequently poorer. 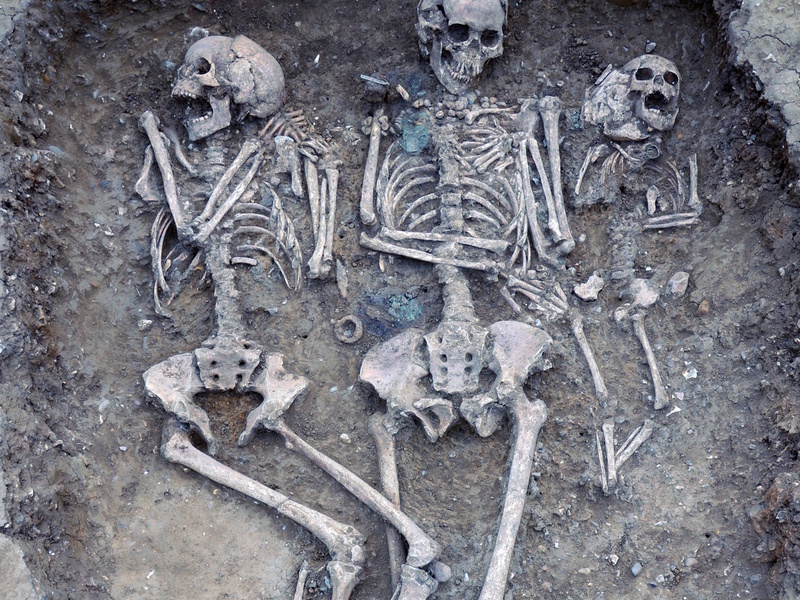 Modern British and continental European genomes from the UK10K project and the 1000 Genomes Project were compared with the genomes from the ancient skeletons. Researchers discovered that the Anglo-Saxon immigrants were genetically very similar to modern Dutch and Danish, and that they contributed 38% of the DNA of modern people from East England, and 30% for modern Welsh and Scottish. The Anglo-Saxons first settled in the South East of England so this pattern is consistent with their migration pattern. The genomes of northern European populations are similar and it is difficult to accurately distinguish between them. To help solve this problem, the study developed a sensitive new method, called rarecoal, which could identify subtle genetic traces in individuals, using rare genetic variants identified in hundreds of present-day people. Earlier methods of mapping ancient DNA looked at common genetic variants from the very distant past, which are present in most people. The new rarecoal method did exactly the opposite, allowing researchers to map more recent events and unravel very closely related populations. The article, “Iron Age and Anglo-Saxon genomes from East England reveal British migration history” was published in the journal Nature Communications. Click here to read it.